Does Nicolle Wallace Think Trump Wanted To Hire Me, Or Is She 'Hot' For Anthony Scaramucci? Does Nicolle Wallace Think Trump Wanted To Hire Me, Or Is She 'Hot' For Anthony Scaramucci? Does Nicolle Wallace Think Trump Wanted To Hire Me, Or Is She ‘Hot’ For Anthony Scaramucci? 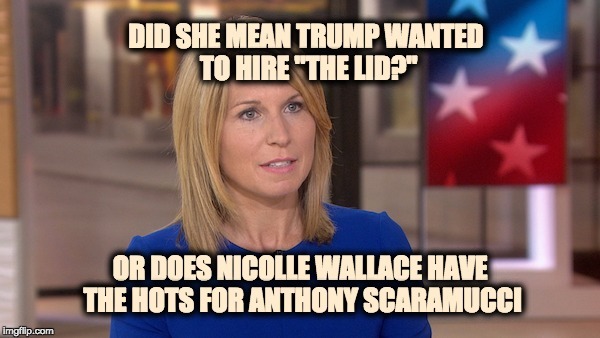 Republican-turned MSNBC political analyst Nicole Wallace claimed on Friday that President Donald Trump’s appointment of Anthony Scaramucci is more about Me (The Lid) on the White House Communications Team than anything else (well either that or Anthony Scaramucci makes her heart flutter). President Trump did not want him to resign but Spicer felt there were “too many cooks in the kitchen” promoting the president’s message. “I just thought it was in the best interest of our communications department, of our press organization, to not have too many cooks in the kitchen,” Spicer told Fox News’ Sean Hannity in an interview hours after he resigned from the White House on Friday. Obviously that is a false charge because if the President wanted better looking men to spread his message he would have gone for the best. However, I was not contacted by the White House to take the job. Perhaps I am looking at it the wrong way. Maybe Ms. Wallace has the hots for Scaramucci and the married liberal had no other way to publicly profess her love. BTW Spicer was replaced by Sarah Huckabee Sanders, a woman.